I am happy to see 2010 go. I can safely say it was the worst year of my life. Not that anything majorly bad happened, but nothing life changing happened either. I feel like I didn't get anywhere in life. I feel like I am in the same spot I was a year ago when I was saying goodbye to 2009. If I could sum up 2010 in one word, it would be struggle. I feel like I have struggled in so many areas. I struggled to get fit and get into an exercise habit, here I am and I haven't exercised in two months. We struggled financially, I went back to work full time and we cancelled our trip to BC. I sure loved working part time, it was ideal. We struggled to conceive a child, after 8 cycles of fertility drugs, I still have an empty womb and an aching heart. I struggled with my relationship with God, trying to grow closer to Him, loving Him as much as I can, trying to live a life that pleases Him. I struggled with myself, trying to figure out if the person I am is the person I want to be. I know I am focusing on all the negative right now, but I need to mourn. 2010 was a very hard year for me. 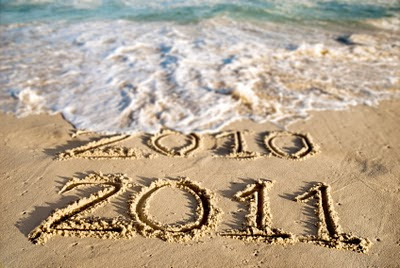 I am hoping and praying that 2011 will be dramatically different, in a good way. I am nervous about more disappointment, but excited for new possibilities. My resolution this year is to not just sit around waiting for life to happen. I am going to make life happen. I am going to have an amazing year, and when I sit here next year and write my review of 2011, it is going to be awesome. I am going take advantage of the time Eric and I have while it is just the two of us. Going to Disneyworld is sure a great start! I leave in 14 days!! Eric leaves in 19!